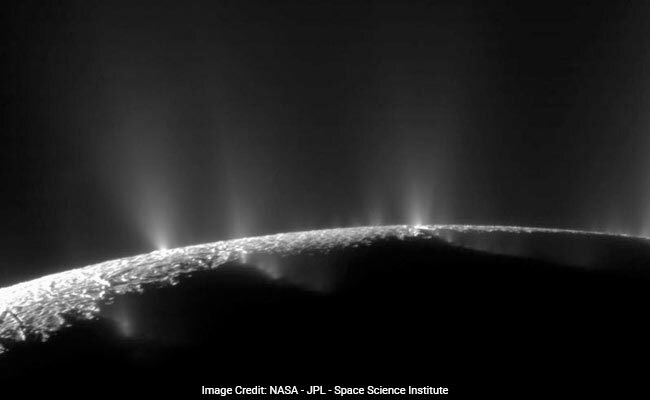 The geysers of Saturn's moon Enceladus are gushing up food for life, scientists say. Researchers report Thursday in the journal Science that the jets of ice and gas gushing from the moon's south pole contain molecular hydrogen, a chemical characteristic of hydrothermal activity. On Earth, hydrogen provides fuel for communities of organisms that live around vents on the seafloor. Its presence on Saturn's icy moon suggests that this alien world, which harbors a saltwater ocean encased in a frozen crust, has the right conditions to give rise to microbial life. "For a microbiologist thinking about energy for microbes, hydrogen is like the gold coin of energy currency," said Peter Girguis, a deep sea biologist at Harvard University who was not involved in the research. "If you had to have one thing, one chemical compound, coming out of a vent that would lead you to think there's energy to support microbial life, hydrogen is at the top of that list." "It makes the Enceladus ocean seem a heck of a lot more habitable than we were thinking yesterday," agreed Ariel Anbar, an astrobiologist at Arizona State University. "And wouldn't we like to know, is there life living there?" 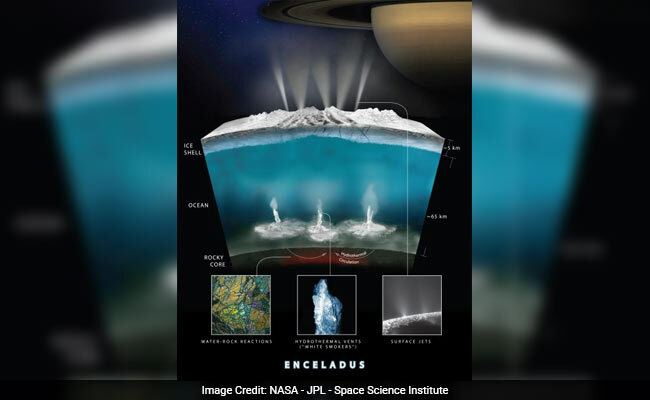 This graphic illustrates how scientists on NASA's Cassini mission think water interacts with rock at the bottom of the ocean of Saturn's icy moon Enceladus, producing hydrogen gas. Enceladus (pronounced "en-SELL-a-dis") provides all three. It's looking more and more like the most habitable spot in our solar system beyond Earth, and scientists' best target yet in the search for alien organisms. And it might not be alone. Images from the Hubble Space Telescope suggest that plumes much like those on Enceladus are also spewing from Jupiter's moon Europa, NASA announced Thursday. "In the NASA strategy for searching for life, the key ingredients have always been water, building blocks like carbon, oxygen, nitrogen . . . and a source of energy," said Mary Voytek, a senior scientist for astrobiology at NASA who was not involved in the research. Knowing that two worlds in the solar system might meet these requirements, "it's very possible that we have life out on one of those moons," Voytek said. Enceladus' geysers have made it a target in the search for extraterrestrial organisms ever since the NASA space probe Cassini detected them in 2005. The plumes are rich with water and organic molecules, and the force with which they gush from the surface suggests that they are driven by a hydrothermal system two-and-a-half times more powerful than the one that powers Yellowstone's geysers and bubbling hot springs. They are also physical evidence of the water in the moon's interior, which is heated by the gravitational pull of Saturn. In October 2015, Cassini flew deeper into the geysers than it ever had before, skimming a mere 30 miles above the moon's surface. The probe trapped particles from the plume inside its Ion Neutral Mass Spectrometer - a "sniffing" instrument that sorts material into its component parts based on mass - and analyzed the icy spray. The results suggest that the geysers contain a surprising ratio of molecular hydrogen, carbon dioxide and methane. The molecules are in "thermodynamic disequilibrium," the researchers say; that is, they're chemically out of whack. Molecular hydrogen (a compound made of two hydrogen atoms) is a very volatile gas, and is not easily trapped on a small, icy world like Enceladus. Its presence in the geyser plume indicates that there are processes beneath the surface constantly replenishing the supply of molecular hydrogen. The paper's authors examined a number of possible reasons for this chemical imbalance in their paper. The most likely explanation, they conclude, is something called serpenitinization. As hot water from Enceladus' ocean flows through cracks in the seafloor, it reacts with the iron-rich rock to form molecular hydrogen. As Enceladus orbits Saturn, it leaves a trail of particles from its geysers in its wake, forming Saturn's "E ring." "But it's not necessarily an indication for or against life" on Saturn's moon, cautioned co-author Hunter Waite of the Southwest Research Institute in Texas (SWRI). If there is life on Enceladus, the scientists know how much energy is available for it to consume based on the ratio of hydrogen in the plume. Co-author Christopher Glein, a geochemist at SWRI, called it "the first assessment of the calorie count in an alien ocean." He and his colleagues found that the moon's hydrothermal activity supplies more than enough energy to power a chemosynthetic ecosystem - the equivalent of 300 pizzas per hour. "We're going to have to go back with new missions and more focused instrumentation to answer that question," Waite said. Cassini won't have any more opportunities to sample the geyser plumes. After orbiting Saturn for more than a decade, the spacecraft is scheduled to start a series of dives between the planet and its rings next week. In September, Cassini will plunge straight into Saturn, burning up almost as soon as it hits the gas giant's atmosphere. 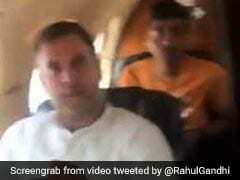 The command sequence for this final mission was transmitted to the probe by NASA's Deep Space Network on Tuesday. 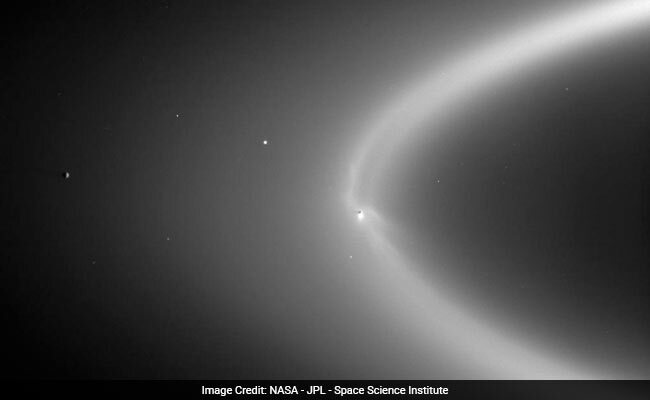 It's Enceladus' fault that Cassini must die - NASA doesn't want to risk the spacecraft inadvertently contaminating the potentially habitable moon, so they cannot leave it hanging out in space after it runs out of fuel. "It's frustrating and thrilling at the same time," Glein said. This is not the first time scientists have detected evidence of geysers on Europa; Hubble has spotted similar plumes several times before. But this detection provides further evidence for the activity, and will help scientists figure out the timing of Europa's geysers in advance of the Clipper mission. The plumes were detected by the Hubble Space Telescope as Europa passed in front of Jupiter. Silhouetted against the hot, glowing form of its host planet, scientists could see gusts of material shooting upward. The jets were so powerful that they extended 50 kilometers above the moon's surface - Old Faithful, the famous geyser at Yellowstone, only reaches 184 feet. When the Clipper arrives in the mid-2020s, it will carry instruments specifically designed to sample Europa's plumes and test for organic molecules. Unlike Cassini, which had no idea what it would encounter when it detected Enceladus's geysers for the first time, the spacecraft should be well-equipped to detect life - if there's any life to be found. Voytek said that her boss, NASA's planetary science director Jim Green, is determined to find organisms beyond Earth before he retires. "You've got a couple of years," he told her, jokingly, when they heard about the Enceladus discovery. "We're just on the precipice of moving this whole activity forward," he told The Washington Post. "I think in our lifetime we'll be able to answer the question, 'Are we alone?' "